Transform your home cinema set up with a Samsung sound bar and experience your favourite films like never before. The beauty of sound bars lie in their capacity to offer truly transformative audio performances without overwhelming your room with bulky home cinema speakers. If you like the idea of immersive cinema sound, but hate the prospect of cluttering your living room with unattractive audio equipment, then look no further. 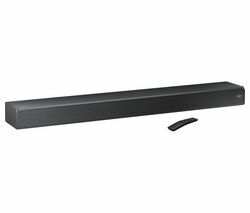 Sound bars offer a sleek, easily integrated alternative that packs far more audio punch than you’d expect, an our full sound bar range includes the latest models from leading brands including Bose, Sonos, Sony, and, of course, Samsung. 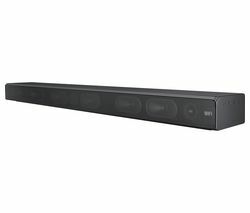 Our range of Samsung sound bars showcase a wide variety, spanning from top of the range models that leverage cutting edge Dolby Atmos technology to deliver unprecedented immersion, to remarkably affordable entry-level sound bars, like the Samsung HW-J250 2.2 Sound Bar. Even entry-level models are guaranteed to significantly improve on built-in TV speakers, which are typically tinny and lacking in clarity. Whatever you’re watching, you’ll instantly appreciate the enhanced audio performance – dialogue will sound clearer and better defined while action sound effects will take on a vivid new life. Sound bars are just one way to improve the audio performance of your cinematic experience. Check out all of the our home cinema systems to find one that best suits your needs.